The solid black pro bike tool cover is made from hardy ripstop waterproof material making it an ideal outdoor bike cover. The material is made of highly durable Oxford material with reliable double stitching design that makes keeps your bike safe from any risk of being exposed to harmful sun rays, wind or any other external factors. Additionally, the ‘heat sealed’ seam further ensures your bike is protected from the heat. 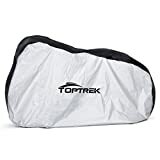 The pro bike tool cover reviews are great for your cruiser, road, electric bike, and hybrid bike thanks to its large size. The lock-hole design and the buckle strap makes this bike cover worth investing in. In a words, The Pro bike tool cover is perfect for outdoor bicycle storage and that is waterproof in technology. Like any other product, the price of bike cover ought to be factored in when purchasing a bike cover. For an outdoor bike cover, it worth mentioning that it can be pretty expensive buying one compared to buying an indoor bike cover. But then considering the high level of protection an outdoor bike cover provides, it is not a bad idea investing in one. However, this does not mean you should spend more on a bike’s cover. You should aim at getting a value for your money, in that, it should not cost you more than your budget range and at the same time not compromise on the quality. A bike cover with two to three years shows that the manufacturer has enough confidence in the durability of the cover. Thus in your purchase of a bike cover go for one with a warranty not less than 2 years. Here’s a look at the main key features at a glance. The manufacturer of the pro bike tool cover did a good job of designing a lock-hole for the security of your bike. Although a bike lock is not included, the lock-hole can be used either with a chain, cable or U/D locks for additional security. The holes are located on the front thus you can lock the front wheel on to a rail or post. On top of it all, the adjustable buckle strap and ‘toggle’ elasticated wheel fit, allows the cover to securely fit even on strong windy days. The reflective safety loops also contribute to the safety by making it easy to locate the bike. A bike cover that can fit 2 small/ medium sized bikes sounds like a great deal. Well, that I the case for this pro bike too cover that comes with a generous size that can comfortably fit an electric bike, road bike, 29er, and hybrid bikes. 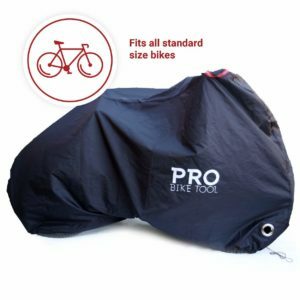 The bike cover measures 208 cm long by 111 cm wide by 76 cm tall for an XL-sized pro bike tool cover which is large enough to cover two bikes if they are all placed facing the same position. However, the XL size version of this bike cover is not compatible with tricycles, recumbent bicycles, and scooters. It is therefore recommended that you measure your bike prior to purchasing the cover so as to avoid disappointments. In the process of removing a bike’s cover off the bike, one might end up tearing the cover especially if it is entangled at the handlebars. The case is different for the pro bike too cover that comes with reflective safety loops that make it easier to locate handlebars ends to allow for easy removal and fitting of the bike cover. The emphasis put on the material used to make a bike cover can never be too much. It is from the material, one can determine the durability as well as the quality of protection a bike cover offers. The pro bike too cover is made of a very strong and durable RIPSTOP ‘oxford fabric’ with raised interlocking weave which makes it hard to get ripped off. The material is also PU coated and made to stand up to all weather. Moreover, the ‘double stitching’ and ‘heat seal’ features goes a long way into ensuring top-class protection. A bike cover with an attached fabric handle makes it easy to carry the cover. This means the bike cover is portable. The handles can be used also to hang the cover, say after cleaning it or removing it from the bike. 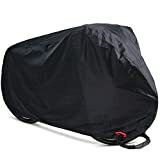 Considering this bike cover is quite large, the handles make it easier to maneuver, so having a handle is useful as well as a good reference point for positioning the cover into the desired position. And the fact that they are made of a quality fabric makes them long-lasting and able to handle a significant amount of pressure. Additionally, you can a few reflective strips on the handles for additional visibility. Generally, handles can serve a variety of customized purposes. Though the color of a bike cover doesn’t make much difference, it can be argued that a black colored bike cover is more likely to blend in with the surrounding since it is less conspicuous. Well, compared to other ‘shouting’ colors a black colored cover tends to be more discreet. 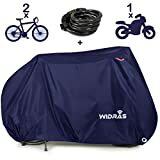 Most bike owners do not prefer a bike cover that ‘shouts’ to the whole world you are storing a bike at a particular place. That’s how the pro bike tool cover is made. It is entirely black with a few shouting colors or logos. Finally, it is a great choice for those who have to need an XL/XXL size and waterproof cover. Moreover, it has the UV-anti protection technology that safely protect your bicycles in all types of weather. The high-performance of this bikes cover is best suited for mountain and road bikes also.